Dr. Camille Kamga is Director for the University Transportation Research Center (UTRC) and an Assistant Professor of Civil Engineering at The City College of New York. As a consortium of 18 major U.S. academic institutions, UTRC asserts a significant role in the Federal Region 2 and nationally, conducting research and projects on surface transportation, carrying out training and educational programs and actively disseminating the results of its work. It is one of the few such Centers in the U.S. federally designated since 1987. 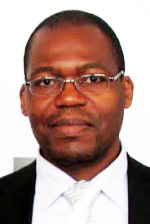 Dr, Kamga is a member of the TRB’s Urban Transportation Data and Information Systems Committee (ABJ30). He serves in the Board of Director of the Intelligent Transportation Society of NY – a professional group providing education and outreach to foster the understanding of ITS applications and technologies. He is also a member of Education and Research Committee of the International Association of Transportation Regulators. He holds a Ph.D. in Civil Engineering from the Graduate Center of the City University of New York, specializing in Intelligent Transportation Systems (ITS). He is the 2006 recipient of the National Pikarsky Award for Outstanding Dissertation in Science and Technology from the Council of UTC.